CHICAGO -- The Public Library Association (PLA) has developed a new product designed to boost early childhood literacy programming in libraries, schools and daycare centers. PLA's 2019 Early Childhood Literacy Activity Calendar is now available for sale. Based on the core practices of Every Child Ready to Read @ Your Library, PLA's parent-education initiative, the publication emphasizes activities involving reading, writing, singing, talking, playing and counting. The calendar includes twelve months of learning activities, book lists and nursery rhymes. One side of each page has a calendar with a fun skills-building activity for every day of the month, and the other contains supplementary content like nursery rhymes, early literacy tips, song lyrics and suggested reading material. 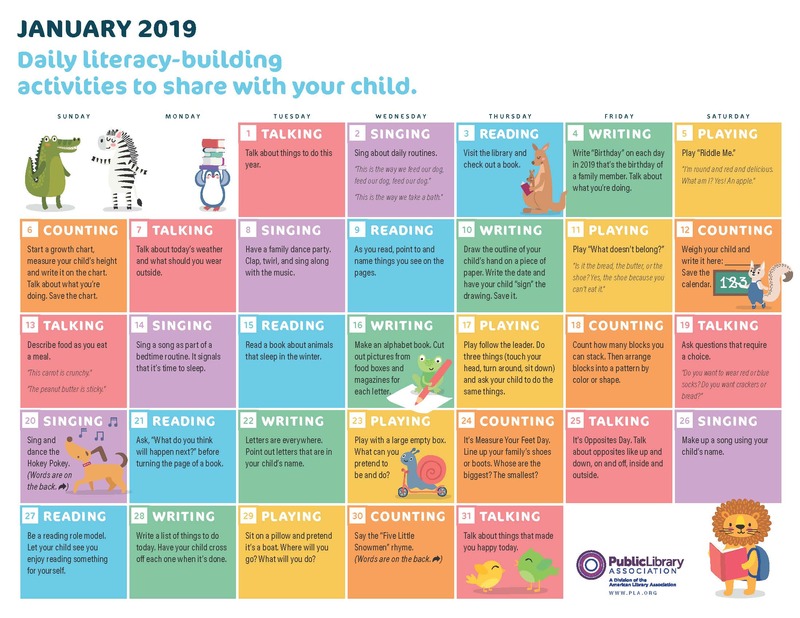 Click here to download a copy of the 2019 Early Literacy Activities Calendar. This digital download costs $23.99 for PLA members, $26.99 for American Library Association members, and $29.99 for non-members. Questions regarding the Calendar and PLA's early childhood literacy work may be directed to Kathleen Hughes at khughes@ala.org.